Outdoor kitchens remain high on homeowners’ wish lists, and can range from a simple “plug and play” grill island to a far more complex addition of built ins under shelter designed to take every cooking chore outdoors. Outdoor living and outdoor kitchens are the number one desire for many homeowners, according to Carol Sullivan of Nashville’s Hearth & Grill Store. 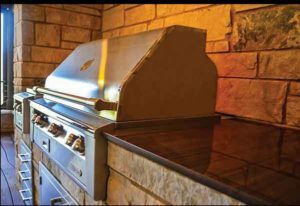 “The demand for outdoor living has led to the expansion of manufacturer’s offerings,” she says, everything from portable outdoor grills to grills installed in custom islands, with added features such as refrigerators, side cookers, ice makers, smokers from The Big Green Egg, and kegerators. “Our customers tell us what they enjoy most is the convenience of having everything they need outdoors right at their fingertips. 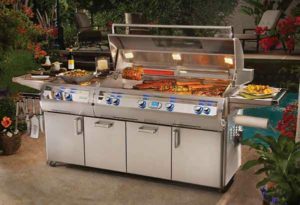 While backyard cooks and entertainers have varying preferences for their accessories, ranging from the big grill to the side burners, from the refrigerator to the icemaker, what they enjoy most, according to Sullivan, is having their family and friends around the grill. 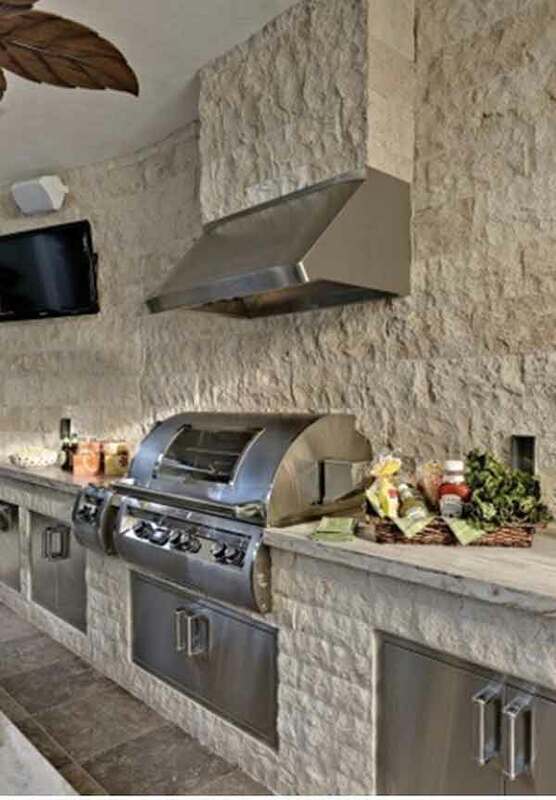 The grill and smoker are the centerpieces of the outdoor kitchen, according to the Hearth, Patio & Barbecue Association, but it’s the layout and architecture of the outdoor kitchen that helps set the vibe no matter what’s on the menu. Outdoor kitchens invite the openness of the great outdoors and are similar to indoor kitchens, with expansive counter space and full food preparation areas complete with sinks and plumbing. The addition of a dishwasher and a refrigerator makes trips inside to clean up or grab a cold drink a distant memory. Depending on the available outdoor space and the size of kitchen, open air architecture can create a tropical or cozy cabin atmosphere—they provide entertainment and relaxation no matter the season. A major addition to many outdoor kitchens in the past couple of years have been pizza ovens. They have quickly grown in demand and come in a variety of designs and styles. Brick and stone built pizza ovens are most popular and often come with space for storing wood for added convenience. Aside from the unique taste that pizza ovens bring to the table, the open flames provide the perfect ambiance for an outdoor space, no matter what the toppings may be. Outdoor cooking equipment, whether fired with gas, wood, or charcoal, regularly reaches temperatures well above what a home oven can safely hit. In recent years, dozens of manufacturers have taken advantage of this to produce ovens that promise true Neapolitan-style pizza in the backyard, eliminating the need to build a full-blown stone oven. Generally, pizza ovens are also great for cooking any type of food, from searing steaks, to roasting chicken, to baking cookies. Outdoor projects have grown in size, style, scope and budget, according to industry observers. “The costs mimic the costs of an indoor kitchen, and the appliances and interactive experiences are limitless. Pizza ovens and grills, for example, bring excitement around food collaboration and creativity into the mix. Outdoor kitchens are not just a place to barbecue. They offer an experience where families and friends celebrate with each other in a way that allows them to be unplugged and relaxed.